Heinz baby Food 1953 Ad. This black and white March, 1953 ad states youd naturally expect the finest baby Foods from Heinz. Of course all baby foods are good these days. But it stands to reason that Heinz ought to be a little better. Picture shows bright eyed baby with cap on looking very serious. Also cartoon baby pushing wheelbarrow full of Heinz baby foods. Magazine tear sheet picture is taken through plastic and may show wrinkles or crookedness that is not in the ad. This Original magazine tear sheet measures 8 inches wide by 11 inches tall. 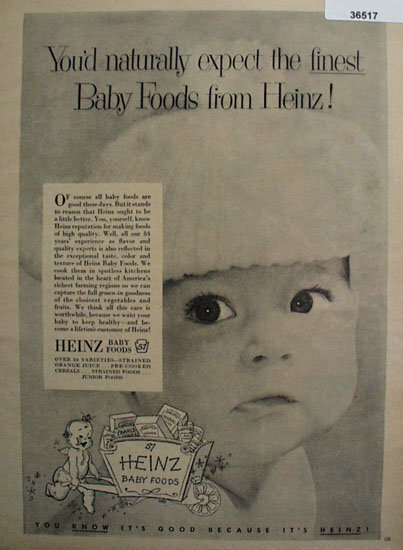 Items Similar To "Heinz baby Food 1953 Ad"